Unlike many fad diets out there, the ketogenic diet has numerous scientifically proven benefits. It is all based on a metabolic process called ketosis, in which your body switches from burning carbohydrates to using fat as its main source of energy. This is quite an efficient and healthy way of losing weight, as it boosts the overall quality of your health and leaves you with no harmful side effects. There are numerous supplements that are designed to help your keto lifestyle, but which one should you choose? 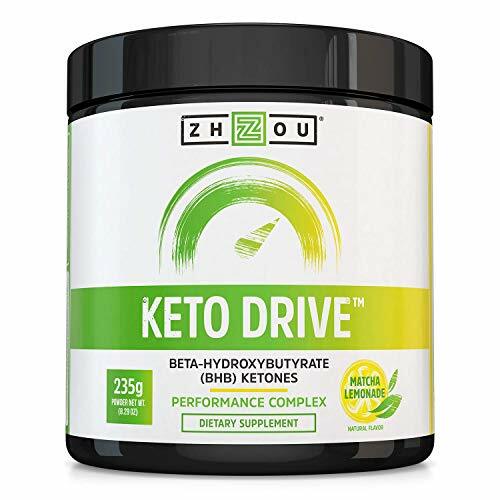 May we suggest trying out the Keto-Drive from ZHOU Nutrition? Read on to find out all about it. As its name suggests, Keto-Drive is a dieting supplement, meant to drive you to the state of ketosis as fast as possible and make you stay there. ZHOU Nutrition is known for its health supplements, so you can believe their claims about this products. When following a steady diet, accompanied by plenty of exercising, this supplement will give you the opportunity to burn more fat at a faster pace and help you lose all the unwanted weight. Unlike some other products on the market, Keto-Drive by ZHOU Nutrition is made exclusively from natural ingredients. This greatly reduces the risk of potential side effects, but still, it should only be used by adults. Before taking this exogenous ketones supplement, make sure you consult your doctor if you have a medical condition, as they will know what’s good and what’s not good for your overall health. Keto-Drive not only helps you with weight loss, but it also gives you plenty of energy and mental drive. It is a drinkable type of supplement and it comes in three different flavors – Orange Mango, Matcha Lemonade, and Black Cherry. When you look at the list of ingredients, you will notice that it’s quite superior to most of its rivals as it contains no carbs or fat, and only the Black Cherry flavor includes caffeine as an ingredient. The most important thing about the supplement is the Keto Drive BHB salts, which supply the exogenous ketones that make ketosis happen. It is because of these salts that Keto-Drive is an excellent source of magnesium, sodium, calcium, vitamin A, magnesium beta-hydroxybutyrate, sodium beta-hydroxybutyrate, and calcium beta-hydroxybutyrate. Maybe you’ve previously heard that these ketogenic salts taste horrible, but ZHOU Nutrition did a great job of masking them with some really tasty flavors, so you shouldn’t worry about that. Also, if you still don’t like the way it tastes, we are happy to report that Keto-Drive is compatible with other drinks, which you can mix it in to enhance the flavor. These include all sorts of smoothies and fruit juices. Since all of its ingredients are natural, you don’t have to worry about any side effects, aside from the known initial side effects of the keto diet. Some keto supplements which contain caffeine can sometimes cause troubles, but that simply isn’t the case here. The most important ground rule with any keto supplement is that you have to take it on a regular basis if you want it to do its magic. Some people take it before or after a meal; some use it as a meal replacement, while yet others prefer taking it before or after their training. Either way, it complements a steady dieting regime and/or workout routine. Discipline is key here, so you really need to stick to it if you want to see and feel true results. So far you have probably understood that this is a quality supplement from a reputable manufacturer, so we don’t really have any reasons not to recommend it. If a keto lifestyle is your thing, you should know that there are other alternatives out there. One worthy alternative is the Exogenous Base from Perfect Keto. It is yet another beta-hydroxybutyrate-based exogenous ketone supplement, but as its name suggests, it provides a strong base and a good starting point especially if you’re new to the keto lifestyle. A well-rounded supplement which can be enjoyed by anyone, it even comes in five different flavors, which include Chocolate, Peach, Coffee, Vanilla, and Salted Caramel. We should also point out that it fits in the same price range as Keto-Drive from ZHOU Nutrition. Whatever your choice might be, hopefully this article will make it easier for you to choose the right supplement for your new keto lifestyle. Just make sure that you are patient enough and that you exercise regularly and don’t stray from your diet. These products are not designed to give you fast results in a matter of days, so it is very important that you show some discipline and have patience. However, we suggest you have a look at our top recommended exogenous ketones supplement.